Just outside of the tiny hamlet of Jamison City, a pristine mountain stream tumbles down a beautiful gorge. Blackberry Run begins in SGL 13, gathering water on the 2,000 foot plateau, and then it becomes a waterfall wonder on its way to the valley. I have long known that there was a waterfall on Blackberry Run, I just didn’t know how many. It was time to see what was in that deep gorge. Of course, it couldn’t be too easy. Private land blocks the bottom of the gorge along the road, although the waterfalls are on the state game lands. So I had to hike around the private land. It was a very steep climb over slippery, loose rock and sodden leaves. I reached a moss covered ledge with an overhang. In the overhang was freshly excavated rock and dirt that revealed a hole into an inner chamber- an active bear den. I hiked up further and looked at the ledge from the side, revealing the profile of a face. The forests were veiled in mist, creating a spooky setting. The steep climb continued until I reached a tier of cliffs with little caves and openings. The jagged rim of the cliffs faded into the mist. It turned out I climbed much further than I needed. I carefully descended to Blackberry Run, and right to the falls, which were embedded in a glen. The falls are no more than 20 feet high, but are very scenic. Ice flows and icicles adorned a spring-slicked ledge to the right. Below were more slides over smooth bedrock. It was very beautiful. I decided to hike upstream. I’m glad I did. The creek had several large boulders and countless cascades. I followed an old grade under massive ash trees (big ash trees! ), the largest I have ever seen. They were well over 100 feet high and had massive trunks. Rain began to fall, but I pushed on, crossing the crystal clear stream a few times. My gut told me there was something more. And there was. I reached a gorgeous twisting waterslide that surged into an amazing swimming hole. What a place to be on a hot summer day. Above, the creek flowed over steps of bedrock. I looked up to see another falls, about 15 feet tall. It was a beautiful waterfall. I wanted to go further, but with the rain and fading light, I decided to turn around. I walked down the stream, surrounded by the beauty of the gorge. I looked down to see someone had built a small cairn in the water. Someone else likes it here, too. The old grade took me above Blackberry Falls. I dropped down to the creek and looked upstream. The view was stunning. Tiers of waterfalls led up to Blackberry Falls, creating a continuous gown of white. I climbed out of the glen and hiked around the private property. Fog lifted in the valley below. I reached my car, wet but happy to see another gem in the Endless Mountains. I began at the game commission parking area east of Blackberry Run. No trail leads to the falls on the game lands. A steep climb (with some picky barberry bushes), and then a steep descent to the falls is required to bypass private land. The hike is short, but the terrain is difficult. 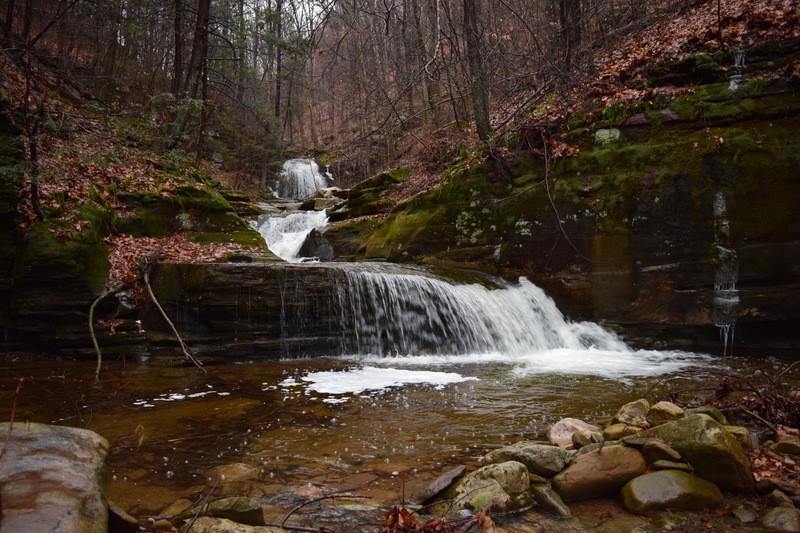 The falls is roughly a quarter mile upstream of the game lands/private property boundary. 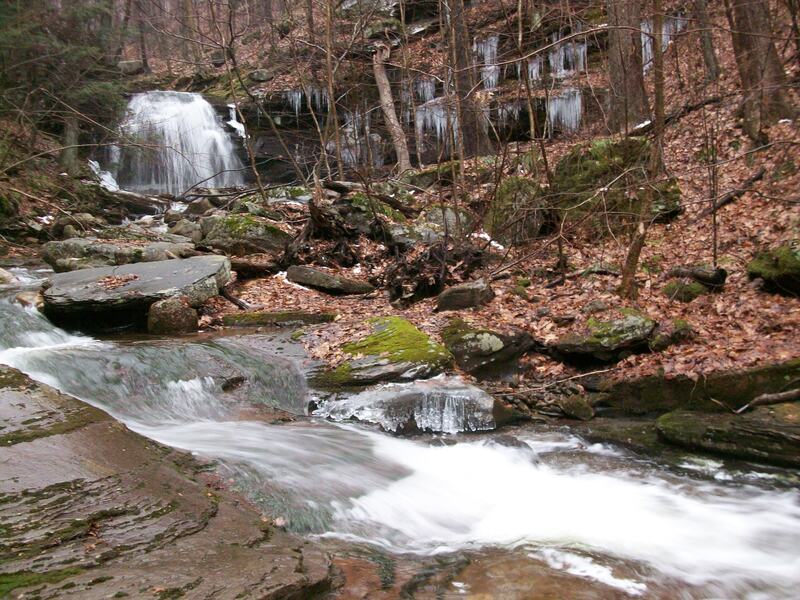 I have hiked Heberly Run and Sullivan Branch but have never been to Blackberry Falls. It was not clear from the map where you parked. Also, how do you identify the private land? I read your post about Kasson Falls but would not want to hike on private land without permission. Is there a way to get permission so that you are not trespassing? I enjoy your Catskills blog. Love the Catskills. The parking area is just past the fenced in PGC building, on the left. There is a small “parking” sign. The SGL boundaries are marked with white paint on trees, I kind of followed that. The no trespassing signs (they weren’t that frequent in the woods) also helped define the boundaries. You’ll see a PGC building surrounded by a fence. Go on the Jamison City side of the fence (not Heberly Run side) and hike up. You’ll encounter some barberry bushes. I noticed some faint trails, so people seem to be going back there. Ascend diagonally to your left to the first rim of prominent ledges/cliffs. Go on top of that and then work your way down to the run. I think that will avoid the private land. The terrain is steep and there is loose rock. No trespassing signs and SGL white blazes defined the boundary across the run. 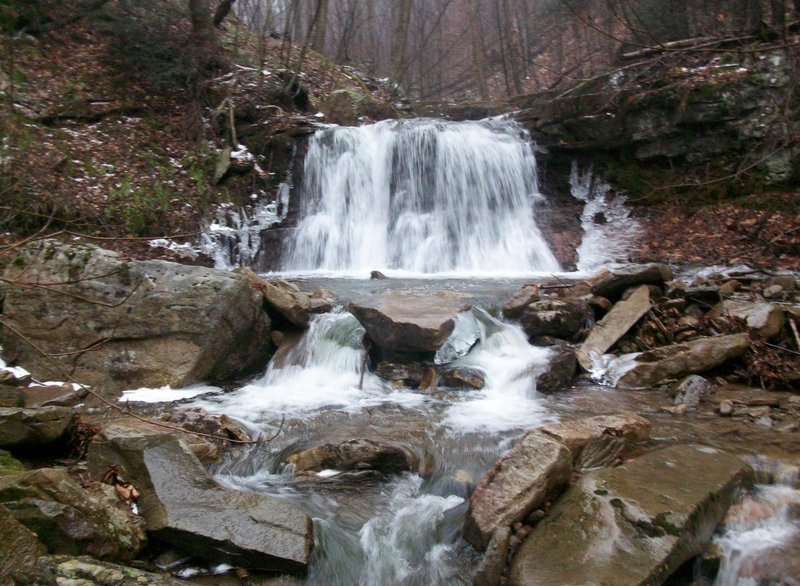 The additional falls and slide is roughly 1/3 of a mile above Blackberry Falls. I’m not sure who owns Kasson Falls, although hikers and ice climbers frequent it.